You have data, we have advice. Anything from Data Viz to making actionable insights from data. I am a frequent follower of Andy's Monday Makeover challenge and love to see what new and interesting data sets are presented every week. That being said, I am taking up Andy's challenge. Here is my take on the Bryce Harper Valuation from fivethirtyeight. When I think about valuation, I started to take a different take on the data. What is the "most bang for the buck" that the top valuation makers? Essentially, I wanted to analyze from how much salary they are getting paid, what is the valuation they have derived? 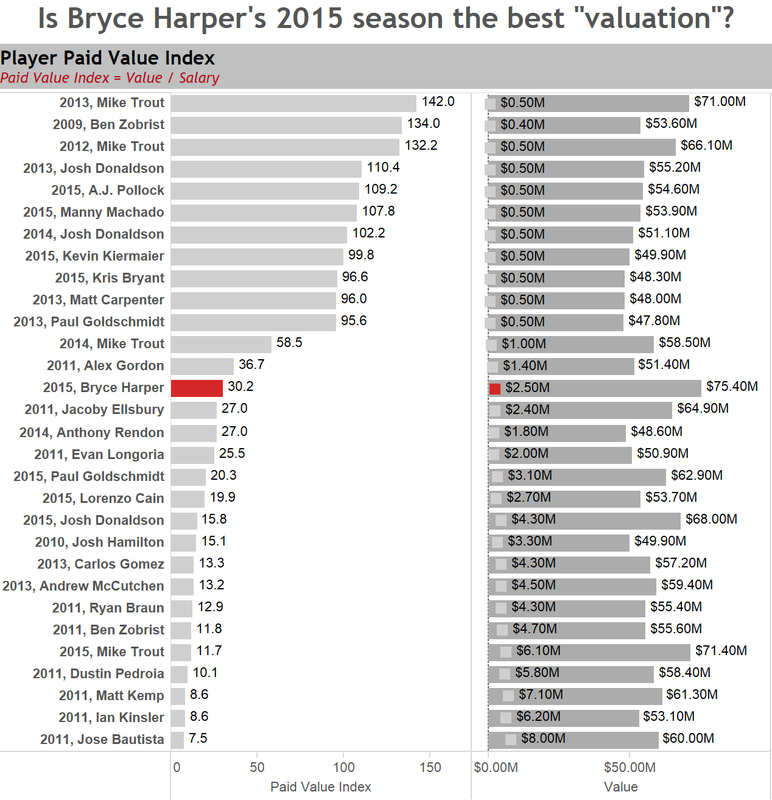 When looking at this presentation, Bryce Harper's 2015 year may not be the "most bang for the buck." Instead Mike Trout's 2013 year was much more valuable. For those taking a look like Mr. Money Ball "Billy Bean", getting the most out of those rookies early may be the best way to get the most "value" going forward. Making it to Predictive Data Needs!!! I am a "data geek". Someone who is passionate about enabling actionable insights off of data by building solutions and making data-driven decisions. I have experience with a variety of industries including Manufacturing, Supply Chain, Retail, Social Networking, and others.